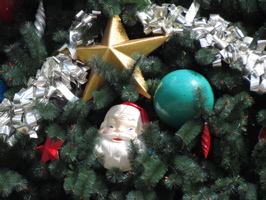 Santa is a familiar theme running through many of the ornaments on the tree (below, left) as well as in garland around the park. 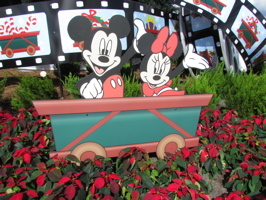 Mickey and Minnie take their place below the Christmas tree in the midst of poinsettia plants (below, right). 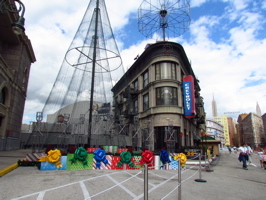 The Christmas tree’s base is film themed on the bottom (below, left). 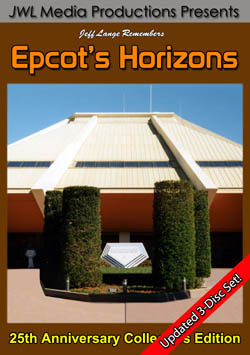 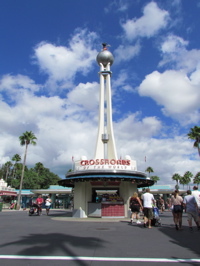 The Crossroads of the World building was also decorated with pretty garland (below right). 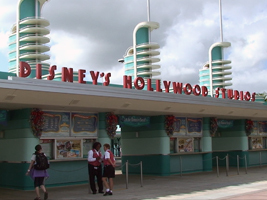 Video #1 – Disney’s Hollywood Studios Christmas Tree 11/3/11 Walt Disney World – Disney’s Hollywood Studios is close to fully decorated for Christmas! 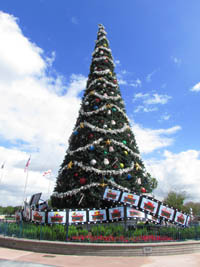 This is the tree out in front of the gates. 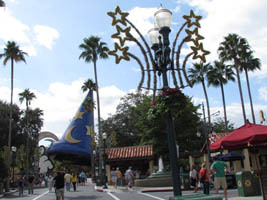 Stars are seen in various decorations around the park (below, left). 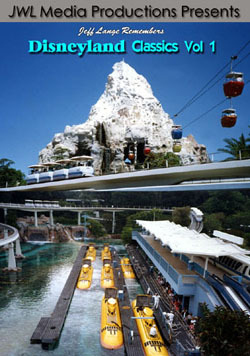 The Minnie Mouse chorus line first showed up at the Celebrity 5 & 10 about a month back (below, right). 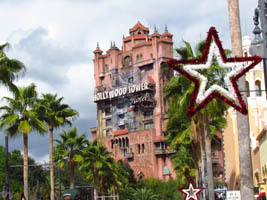 The Twilight Zone Tower of Terror always looks more festive with holiday stars in front of it (below, left). 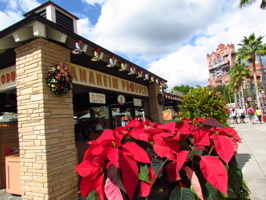 Poinsettia plants in the foreground of the Anaheim Produce shop lend color to the photo (below, right). 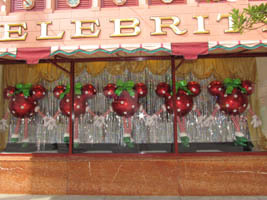 Bells are hanging from the shop as well, those are harder to see. 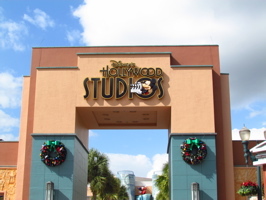 The archway to the Animation Courtyard now has holiday wreaths added to it (below, left). 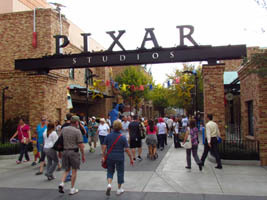 Pixar Place hangs stars throughout the area (below, right). 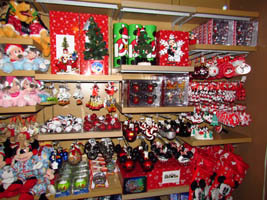 Christmas merchandise first started showing up a month or so back, but more has been added over the past few days (below, left). 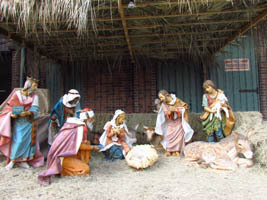 And we were here late last week to see the Osborne Family Spectacle of Dancing Lights display progress, but it’s changed quite a bit since then – including the Nativity Scene, ready except for baby Jesus (below, right). 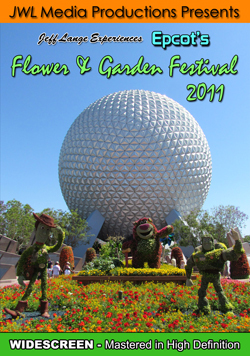 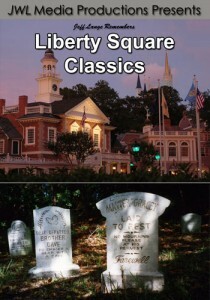 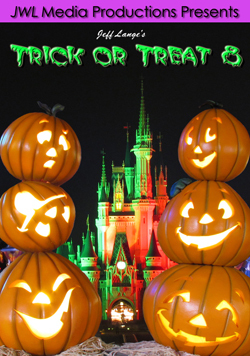 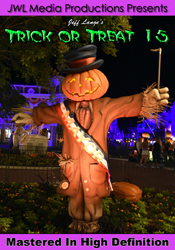 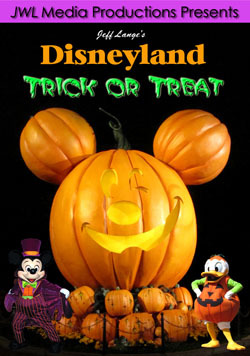 Check out last years display HERE. 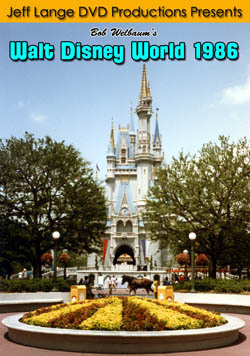 Gifts line the location where the switch will be flipped to start the Osborne Family Spectacle of Dancing Lights each night ( below, left). 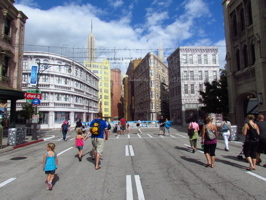 Guests walk down the Streets of America, below the Osborne Lights sign (below, right). 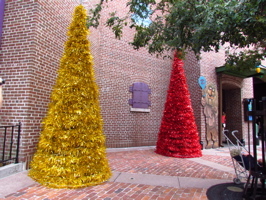 Colorful Christmas trees line the Muppet Courtyard (below, left). 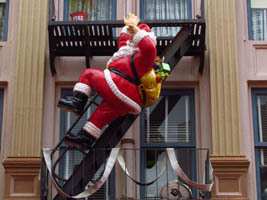 Santa Claus hangs from a balcony near Mama Melrose (below, right). 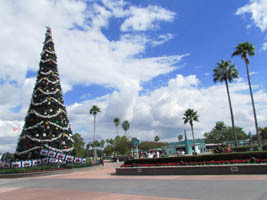 It really is starting to feel like Christmas around the parks (well except for the shorts weather). 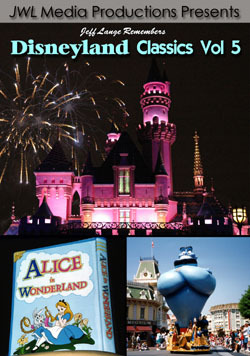 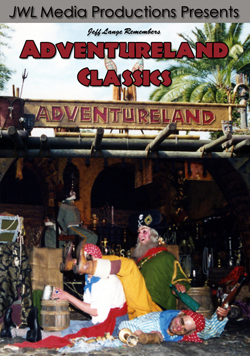 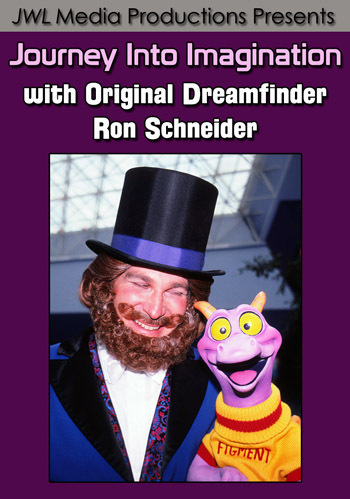 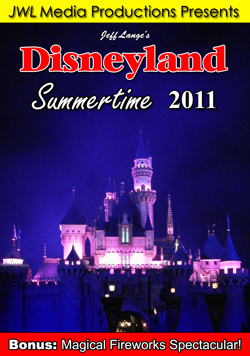 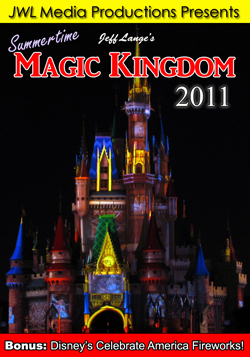 Next week begins the first Mickey’s Very Merry Christmas parties and we’ll be there! 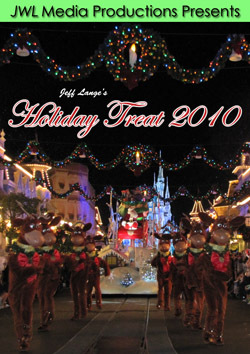 Video #2 – Disney’s Hollywood Studios Christmas Tree and Holiday Decorations Tour 11/3/11 – Disney’s Hollywood Studios is nearly fully decorated for Christmas! 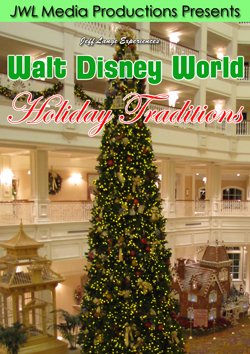 The Christmas tree, decorations and Osborne Lights (not yet lit) are all here.